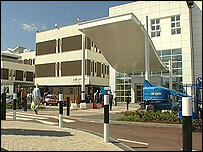 A laptop containing the medical records of more than 5,000 patients has been stolen from a Black Country hospital. It was taken from the outpatients department at Russells Hall Hospital in Dudley, West Midlands, on 8 January. The computer contains a database with information on 5,123 patients with a blood disorder, the hospital said. Thousands of people have been sent letters warning them their personal details have been stolen. West Midlands Police have launched an investigation. The theft follows several high profile laptop thefts, including that of a Ministry of Defence computer containing personal details of more than 500,000 people which was taken from a car in Birmingham. The affected patients have an anticoagulation disorder, meaning their blood does not clot effectively. A spokesman for the trust said the laptop and database were protected with two separate passwords, making it very difficult to access. He added: "We would like to apologise for any concern this matter has caused those patients affected and would like to reassure them that the information on the database is unlikely to be recoverable." The trust added it had no evidence that the patient information on the stolen laptop has been accessed.